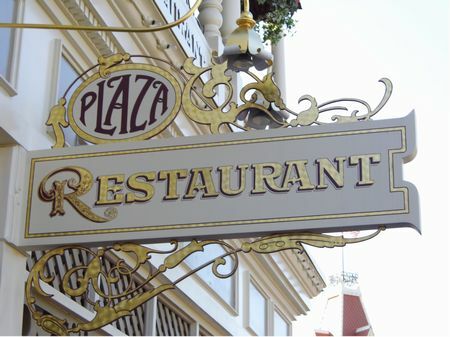 I usually plan to eat at the Plaza Restaurant in the Magic Kingdom on a day when I haven’t made any fancy dinner reservations. I like to have a big lunch around 1 p.m. at The Plaza and then just get a quick service meal later on for dinner. My daughter suffers from multiple food allergies so I have to have at least one scheduled meal a day to make her dining easier. I eat at the Plaza on these days because it is really good home-style meals with large portions. We had a 1:10 reservation and I’m happy to say we were in our seats by 1:05. As soon as we let our server know about my daughter’s allergies, we thought for sure we would be waiting for quite some time to speak to the chef. Chef Ken appeared at our table within minutes. While discussing the allergies with my daughter he found out she was a chef as well and immediately sat down next to her to tell her how he would prepare her food. Cross contamination is always a big fear but Chef Ken guaranteed her that he would prepare her food himself on dedicated equipment. Off he went, back to the kitchen to start her lunch and in just a few short minutes he returned with samples for us to taste – he wanted to share with her how he prepares gluten free bread to taste like REAL bread – and wanted her to taste it before he prepared her meal. Let’s face it – gluten free bread tastes like cardboard but Chef Ken is definitely a miracle worker when it comes to making it taste just like read bread! Here’s his process: The gluten free bread is kept frozen, so he puts the portion he needs in the microwave for just a few seconds to defrost. He then soaks the bread/rolls in a small amount of olive oil, allowing the bread to absorb the oil. He then puts the bread on a griddle to toast. Simple but something we have never thought to do. He gave me samples to taste and normally the thought of gluten free bread is not very appetizing, but this was delicious! My daughter was thrilled with her lunch! Chef Ken definitely takes pride in caring for guests with food allergies – and it shows in his preparation and the care he takes with each dish. If you are a food allergy sufferer, don’t ever hesitate to eat at the Plaza! He is the absolute best!! I have Celiac’s and for once I felt like I was “normal”. I love Disney for that reason.